Supported by the Presencing Institute and a cooperation of two Dutch ministries we started an innovation lab with the name ‘For Tomorrow’s Harvest’ during a period of almost 1,5 year. In late 2017 it began taking shape by means of sensing to identify what was necessary and useful to make a difference in the field of sustainable agriculture and food in the Netherlands. After a series of interviews, 85 participants were selected. Selection criteria were (amongst others) clear affiliation and experience with the topic, having a position within their business or network to assert influence, and (very importantly) an openness to meet others, learn new perspectives and reflect on self and inner leadership. 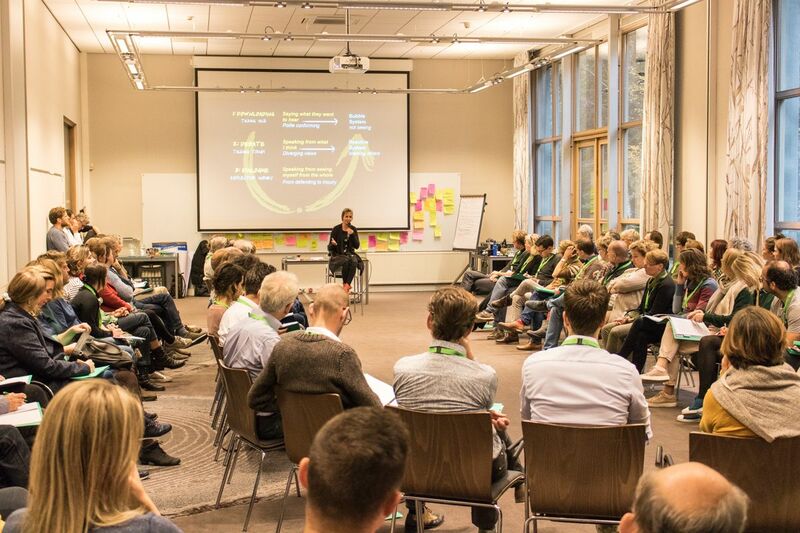 On November 19, these 85 participants gathered in The Netherlands for the three-day kick-off of the Innovation lab ‘For Tomorrow’s Harvest.’ In general, a diverse group of stakeholders was gathered from the agriculture, food, farmers and conservation sector to businesses, government and academia. In the Three-day kick off meeting, the team designed a build-up of methods that helped to unlock the knowledge and wisdom present in the group on various levels. We started by cognitively mapping all existing knowledge, while on the second day we moved to using also our hands and bodies to model both the current system of agriculture and food and the system emerging/wanting to emerge of the future. Here, methods such as 3D sculpting and 4D modelling using Social Presencing Theatre proved very useful. On the last day, participants were asked to reflect on themes or dilemmas that they would like to dive into more and sense its essence in more depth throughout the rest of phase 1. Participants then connected with those other participants with similar dilemmas and made first steps to define the common elements in their themes. Throughout the Kick off meeting, we worked with learning circles, case clinics and personal journaling to give participants room to constantly reflect on their own professional role and responsibility and what was asked of them and what they learned personally in this intensive three-day kick off. In very broad strokes, the following themes were recurring and interrelated topics of conversation: the position of the farmer, the role of the consumer, the influence of money, the dominance and limitations of the current economic system and the way in which ownership of land is organized and the value that is attributed to it (both economically and non-economically). 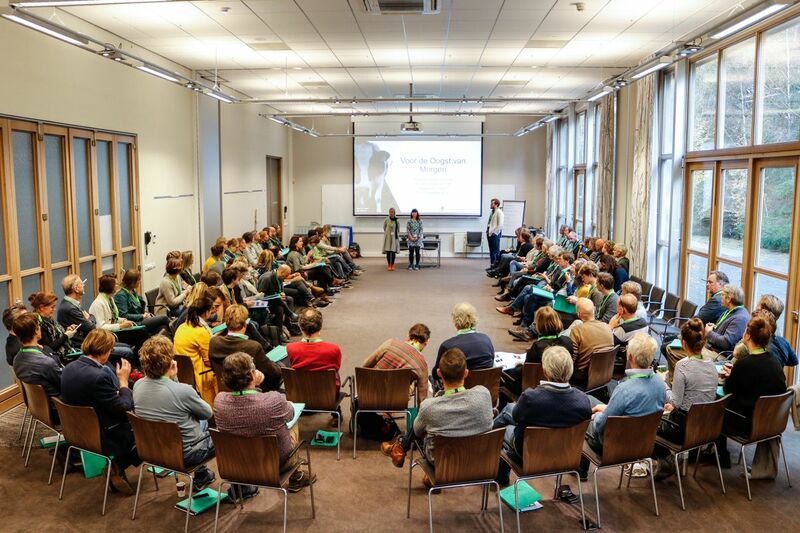 When it comes to the future of the system of agriculture and food as a whole, there is a strongly felt consensus among participants that this future should be defined by more connection based on diverse values. There is also a strong tendency present in the group to connect further research and exploration of the possibilities to specific regions of The Netherlands. When it comes to content, a sustainable agriculture and food system is directly related to, and coupled with, the landscape, the ecosystem, the soil and the planet itself. Finance should take a more enabling role, but how to get to the point where it will actually serve the planet is a recurring question. Lastly, participants mentioned their personal sustainability as professionals working for the transition of the system as a challenge. This refers to both their personal vitality (limitations in time and investment) as well as the durability and impact of the collective.